The 19th Joe Pickett adventure debuted at #2 on the New York Times Hardcover Fiction and Combined Print & eBook Fiction lists. We’ve just received word that it’s entering its fifth week on the Hardcover list! 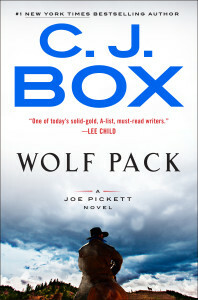 WOLF PACK also nabbed the #1 spot on the Wall Street Journal Combined Print & eBook Fiction list and went on to claim #2 on the Wall Street Journal Hardcover Fiction and eBook fiction list, the Publishers Weekly Hardcover Fiction list, and the Apple iBooks list. In addition, it’s charted on the ABA IndieBound, Amazon, Barnes & Noble, Los Angeles Times, and USA Today bestseller lists. This entry was posted on Wednesday, April 10th, 2019 at 5:44 pm and is filed under Uncategorized.